A new force for at breakfast. The honey-sweetened cereal pieces were shaped liked small figure-eights and were said to taste somewhat similar to Alpha-Bits cereal - but with more crunch. Now comes a spectacular cereal from the outermost limits of the galaxy. It's new C-3PO's. Double Crunch. This unique, double-O shape gives you 2 crunches in every bite - a unique experience in all the galaxy. Spectacular Taste. C-3PO's has an incredible taste. Plus all the excitement and fun of STAR WARS. Golden Goodness. 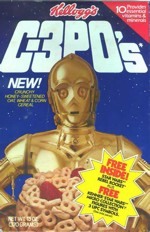 C-3PO's is a golden combination of 3 grains: oats, wheat and corn. And it provides 10 essential vitamins and minerals. Kellogg's introduced C-3PO's one year after the 3rd film in (what was know then as) the Star Wars trilogy appeared in theaters. Suspecting that Return Of The Jedi was the last they would see of their Star Wars friends for a long, long time, fans of the film were delighted to see a commercial for C-3PO's in 1984. In the ad, Star Wars actor Anthony Daniels reprised his role as the famous golden droid. Star Wars-esque graphics and special effects filled the small screen - complete with a jet-propelled cereal box. Known premiums in C-3PO's: Plastic Rebel Rockets, Star Wars Sticker / Trading Cards, Cut-out Star Wars Masks and a send-away offer for Kenner Star Wars action figures. Kellogg's also produced small, individual-serving sized boxes of C-3PO's that were available as part of a multi-pack of cereals. These small boxes are very hard to find and considered a valuable rarity among cereal box collectors. Also see Star Wars Episode II Cereal (2002) and Star Wars Episode III Cereal (2005). What do you think of C-3PO's? View all 23 comments for this cereal. I loved this cereal. It was the 80s. Anything Star Wars was great. Gawd... what a time! I remember making breakfast in bed for my parents when I was 5 years old and it was just two bowls of C3POs. I also wore the Chewbacca mask from the box to annoy my sister. I would eat a 30 year old box of this if I could. This cereal was the best when I was a kid. I was addicted to eating it. BRING IT BACK! I need this in my life! Everything about the original Star Wars was better, even the cereal. 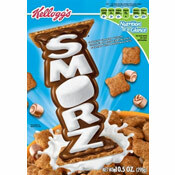 Of all the cereals I've ever eaten, this was my personal favorite. 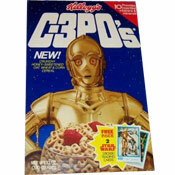 I want this cereal to come back because I love Star Wars. Probably my favorite cereal as a kid. Not the best tasting (not enough sugar, LOL), but the coolest and most coveted. After severing the cereal's ties to Star Wars, the company renamed it Pro-Grain and promoted it with sports-oriented commercials. I loved that cereal! Brings back so many great memories. I really loved that cereal when I was a kid. Too bad they took it off so soon.